One of the most important elements for any online store are its product pages. There are a multitude of aspects that can affect how many sales you make, including which images you use, your page’s layout, and more. To build WooCommerce product pages that sell, you need to use all of the tools at your disposal. WooCommerce packs a lot of product customization features out of the box, but it can be improved upon. In this article, we’ll talk about the importance of excellent product pages and teach you how to introduce advanced customization options using the Fancy Product Designer plugin. Let’s get to work! The better your product pages are the more they’ll draw visitors in. Your product images. High-quality images from multiple angles can mean the difference between an extra sale or a visitor closing your product’s tab instantly. Your Call To Action (CTA). This is a complex elements to master, but their influence in conversion rates is undeniable. If you’re ever in a sales slump and you’ve tried anything else, tweaking your CTA’s text, style, and layout may be the ticket to more sales. Product reviews. This one is fairly straightforward. Online shoppers tend to be very picky, and they’ll often compare products based on reviews. The better your product reviews are, the more sales you might get. Product customization options. In a lot of cases, people like to customize the products they order, be it for gifts or for personal use. Aside from those elements, you’ll also want to use a product page layout that looks great on both mobile and desktop browsers. Plus, there’s also the base information every product page should include, such as the item’s name, a description, its price, and more. To be clear – WooCommerce enables you to add all those elements and more to your product pages. However, it doesn’t enable you to implement advanced product customization, which is where our next tool comes in. That’s a full-blown visual editor customers can use to create a custom wine bottle. It supports multiple layers, color changes, text editing, and more. To be clear, you still have to add new products to your store using WooCommerce, which handles the sales end of the entire process. However, once you enable the Fancy Product Designer plugin, you can add advanced customization options for any of those items. It’s not going to be viable for a lot of them, but it’s still a fantastic way to add some interactivity to select products and make more sales. Plus, you can change the way the Fancy Product Designer visual editor looks from the front end and create basic templates users can choose from for each item. That way, they won’t have to spend time playing with the editor if they don’t want to. Enable your visitors to customize your WooCommerce items before making a purchase. 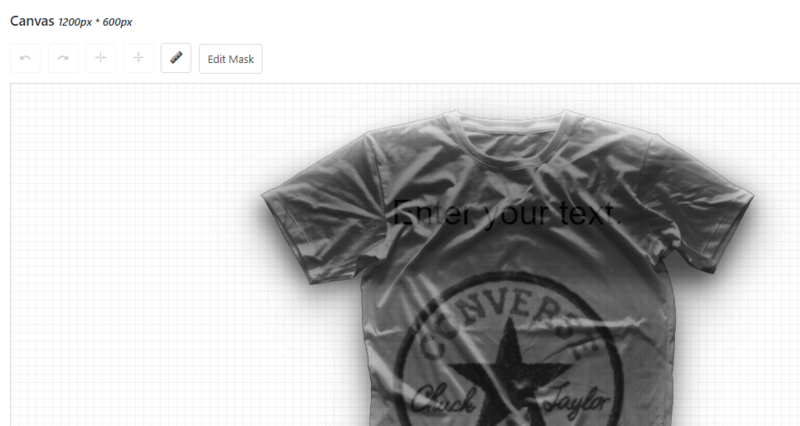 Add customization options to select products. Use a front-end visual editor with advanced capabilities to customize each item. Change the way your visual editor looks by choosing from multiple templates. Despite its breadth of features, the Fancy Product Designer is very simple to set up. Better yet, it doesn’t require any additional configuration out of the box since its default settings are perfect for everyday use. With that in mind, let’s jump right into the thick of things and get to know the plugin’s Product Designer tool. They can, of course, customize the design as much as they want. However, you should always strive to offer a decent starting point for users who don’t want to tweak things too much. There’s also an option to return everything to its initial state, so you can’t go wrong any way you choose. Now you can save your product as a draft or publish it right away. All that’s left now is to wait for those new orders to come in and get to work on handling them. A few small changes to your product pages can make a big difference when it comes to your conversion rates. WooCommerce offers a lot of default customization, but that doesn’t mean you can’t improve upon it. With the right tools, you can turn your WooCommerce product pages into works of art. Learn to use the Fancy Product Builder tool. Configure your UI and product layout. Do you have any questions about how to improve your WooCommerce product pages using the Fancy Product Builder? Ask away in the comments section below! Article thumbnail image by Iconic Bestiary / shutterstock.com. I strongly agree, product visualization is very big influence on sales. That is why we should pay attention to this section. Looks fancy John! Just trying out woo injector layout for making product pages look good.So important to make your product visually appealing. And why can’t Divi do this? I’ll pay extra to not have another plugin. Hello Mulyadi. If you have any ideas for implementing a Divi e-commerce feature, we’d like to hear about it. Post your idea on the Theme Suggestions section on our Support Forum. Good post bro, i will try, thanks for information.